One thing that the Boatbreakers team have learnt is that scrap boats never come quietly. Even a small speedboat on a trailer can cause problems as we found out this week. 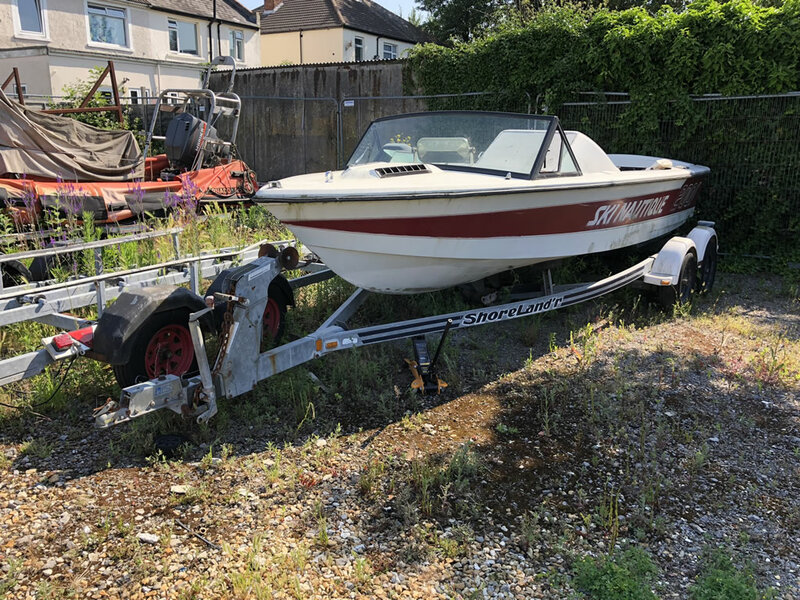 We were asked to remove a boat from Trafalgar Wharf in Portchester by solicitors who were dealing with the estate of a gentleman who’d sadly passed away. It’s never nice to be removing a boat in such circumstances however it’s another weight and cost off of the family’s mind. The last thing a family wants is a boatyard chasing them for storage fees. When we first visited the boat we weren’t sure that the trailer she was on would be good enough to remove the boat with so we decided to bring a flatbed to load her on to instead. The boat trailer had a broken jockey wheel and was engulfed by weeds. It was clear the boat hadn’t moved for a number of years. 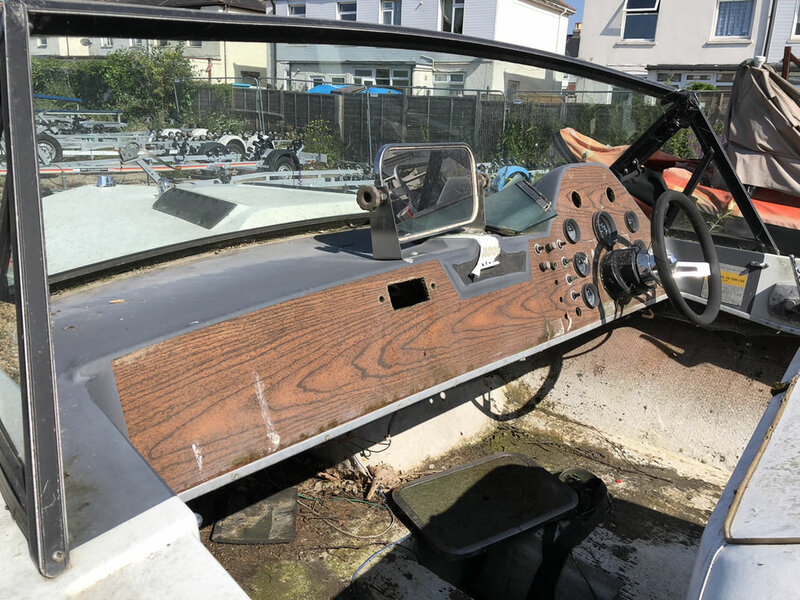 The boat’s interior was a real mess and the only items with any value for us were the large fuel tank, windscreen and the steering wheel. On arrival at the corner of Trafalgar Wharf we reversed our flatbed trailer in as close as possible and set the ramps up on the back so we could hook the boat on to be winched up. We then carefully jacked up the front of the boat so we could line it up with the trailer. With no jockey wheel we wanted to make sure we didn’t damage the trailer so we added in a sacrificial piece of wood to act as a slider. With the front of the trailer up onto our flatbed, it soon became clear we hadn’t quite noticed how wide the boat’s trailer actually was. We should have noticed earlier that the boat being an American design has an extra wide trailer. We could see that the boat/trailer was going to be too wide to be pulled up onto the flatbed. We blame the overgrown weeds for not spotting the trailer’s width! Change of plan… We moved the flatbed and now decided to clip on to the boat and take a chance that the old wheels would have enough air in them. From Trafalgar Wharf to our yard in Tipner it’s only about 2 miles maximum but you can never be too sure with old boats and trailers. We made sure we took it easy and after about ten minutes we were back at base and unclipping the boat. With the engine being long gone from the boat it was a straightforward job of chopping off the bits we want to salvage. The trailer is still in fairly good condition and we’ll be listing it for sale as it would be a shame to weigh in a trailer that could still be used again. With the boat chopped up and the trailer left, we then headed back to Trafalgar Wharf to collect the Flatbed we had left whilst we moved the boat. It wasn’t a total waste of time to have left the trailer where is was as we then had to head to Datchet Water to collect a Flying 15 Dinghy on a trailer. Overall, despite being slightly more challenging than we expected the job went well. 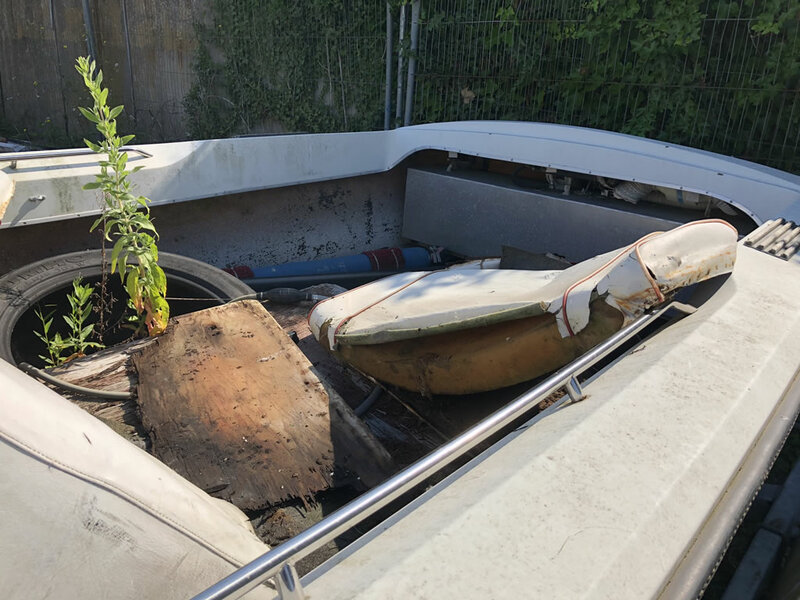 Both the boatyard and the solicitors were satisfied with us removing the boat. And we also still had plenty of time in the day to collect the Flying 15, scrap it and then deliver our trailer back to the trailer hire company. 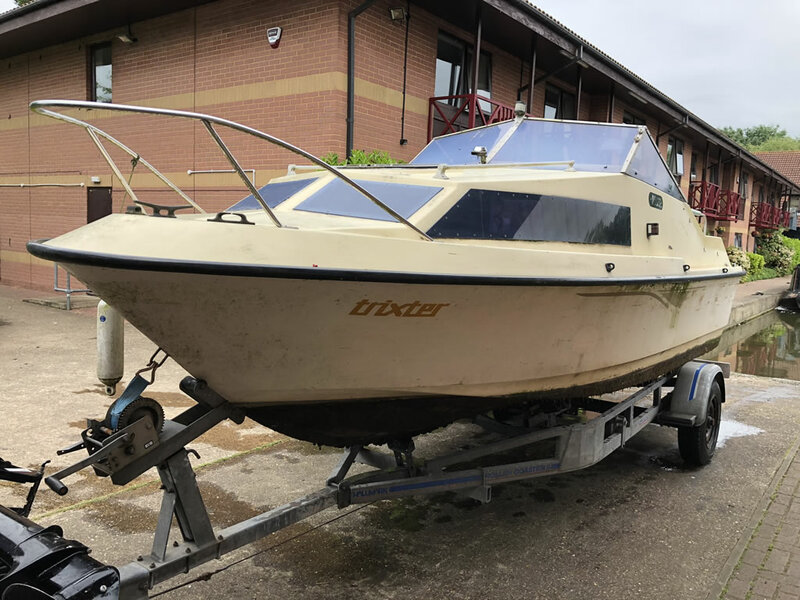 If you have a boat that you no longer use and are paying out every year to keep, why not save money and dispose of her with Boatbreakers. We can usually have a boat collected within two weeks of the original enquiry and often even sooner.